The VNC Authentication None Scanner is an Auxiliary Module for Metasploit. 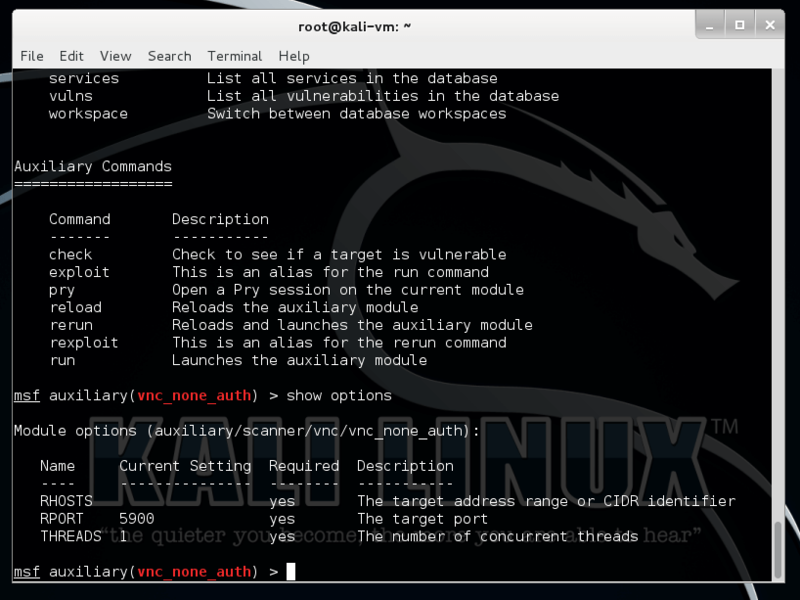 This tool will search a range of IP addresses looking for targets that are running a VNC Server without a password configured. Pretty well every administrator worth his/her salt sets a password prior to allowing inbound connections but you never know when you might catch a lucky break and a successful pen-test leaves no stone unturned. In fact, once when doing a pentest, we came across a system on the target network with an open VNC installation. While we were documenting our findings, I noticed some activity on the system. It turns out, someone else had found the system as well! An unauthorized user was live and active on the same system at the same time. After engaging in some social engineering with the intruder, we were informed by the user they had just got into the system, and came across it as they were scanning large chunks of IP addresses looking for open systems. This just drives home the fact that intruders are in fact actively looking for this low hanging fruit, so you ignore it at your own risk. To use the VNC Scanner, we first select the auxiliary module, define our options, then let it run. [*] 192.168.1.121:5900, VNC server security types supported : None, free access!